We regularly get asked lots of different questions about how we make our delicious tea. We’ve racked the brains of our very knowledgeable team and hopefully you will find the answer you’re looking for. Click on any of the categories below to reveal our frequently asked questions and answers. Tea is commercially grown in many more countries than you might think! There are of course the well-known origins, such as China, India, Sri Lanka, and Kenya, but tea is also grown in less familiar places, such as Argentina, Brazil, Cameroon, Turkey and Vietnam to mention just a few. In fact, there is even a tiny amount of tea grown in Cornwall, but not all origins are capable of producing the same quality or varieties! There are estimated to be in the region of 1500 varieties of tea, however most can be placed under the following headings: Black Tea, Green Tea, White Tea, Oolong, Pu-erh, and Yellow Tea. How do I brew the perfect cup of black tea? We think the perfect cup of tea is made by pouring freshly boiled water (not that water that has been sat in your kettle since your last cuppa!) over the tea bag, leaving it for three to five minutes, and serving it with a splash of milk, but everyone has their favourite way to brew a cuppa. What is the significance of the elevation at which tea is grown? The elevation at which tea is grown affects the flavour in a number of ways; one of the main factors is that temperatures are cooler at higher elevations, meaning the leaves grow more slowly, giving them more time to develop greater depth of flavour. Darjeeling is a tea grown high-up, situated on the foothills of the Himalayas, the elevation reaches up to 7000 feet above sea level, and it is said to be the champagne of teas, with it’s delicious unique muscatel character. Please can you explain the staining of my tea cup? Staining of the cup is due to tannin, and although it’s a bit annoying having to give your mug an extra scrub, this compound helps give tea it’s slightly astringent flavour. To avoid getting your mug stained, you could always use a teapot to prepare your brew! Redbush, also known as ‘Rooibos’, is a South African plant which has the botanical name Aspalathus Linearis. While most of us may consider it a tea, it’s actually a naturally caffeine-free herbal infusion. Whilst it has its own unique and delicious flavour, it’s the closest to tea of all the infusions, and can even be enjoyed with milk like black tea! Clipper is proud to be a member of the UK Tea Council. For more information and insight into the wonderful world of tea please visit www.tea.co.uk. Would you provide your products for charity/fundraising purposes? Do your tea bags contain plastic? From the 20th October 2018 we moved all our production to the first plastic-free, unbleached and non GM (genetically modified) tea bags and we won’t be going back! But we don’t believe in waste so please bear with us while the current packaging stock sells through the shops. This may take a few months but we are hoping that by the time you buy your next box it will have wonderfully plastic-free tea bags in it! Why did you have plastic in your tea bags in the first place? We needed a way to seal the two layers of our tea bag paper together, as paper will not stick to paper, and glue was never used. Unbleached filter paper containing polypropylene was our solution to this and provide the heat-seal function. We never used or considered using PLA (polylactic acid) material in the past (the biodegradable material used for some pyramid bags and other packaging) as it is derived from corn which may be from GM sources. But recent developments mean there is now a new source of PLA which is guaranteed to be from a non-GM source. We were delighted that finally a non-GM source had been found and we started work on development of our new unbleached plastic-free & non-GM paper straight away. What are the new plastic-free tea bags made of? Our new tea bag paper is made from natural plant based materials – a blend of abaca (a species of banana), plant cellulose fibres and PLA- a bio-polymer derived from non-GM plant material that helps hold the paper together – and what’s great is that it does not contain any synthetic polypropylene material. How will I know if my tea bag is plastic-free? After lots of production trials throughout 2018 we are proud to say that all products produced from the 20th October will be made with the first plastic-free, unbleached non-GM tea bag paper and we won’t be going back! Look out for the on pack flash on some of our products. Don’t see it? Don’t worry. Change takes time. We won’t send perfectly good product or packaging to waste, so there’ll be a transition as shops make way for the new plastic-free bags. This may take a few months but we are hoping that by the time you buy your next box it will have wonderfully plastic free tea bags in it. Will this affect the taste of my cuppa? Absolutely not! The same great taste and quality remains at the heart of all we do, it’s just that the used tea bags will be suitable to be popped into your food waste container. How do I dispose of the used tea bags? Can I place the used tea bags into my home composting bin? The new paper is biodegradable and will break down over time, however this may take longer than is expected within home composting environments. While its certainly wet enough in the UK for composting, unfortunately it is rarely warm enough to make efficient home composting possible. We recommend that you pop the tea bag in your home food waste container. Why don’t all your blends have the Fairtrade mark? We try very hard to source 100% Fairtrade ingredients, but it’s not always possible. However, we do work closely with our suppliers to strive to ensure all our ingredients are ethically sourced. If you would like to know more about Fairtrade support in Assam click here. We source our teas from a number of different origins across the globe, including India, Sri Lanka, China, Kenya, South Africa, Tanzania and Uganda, but the specific estates are a secret! All the teas we source are then brought home to Beaminster, Dorset, where we take loving care to blend them, and check the quality to ensure they are just right before they are packed for their journey on to our customers. We work very hard to minimise the risk of gluten getting into our products, so we can say there’s no gluten in our drinks, until you dunk in a biscuit. I have a nut allergy. Can you guarantee that my drink hasn’t been near any nuts? We do not use any nuts within our products or factory, and work really, really hard to keep nut contamination risk as low as possible. What caffeine levels are present in your teas? Tea is a natural product and there are lots of variables which can affect the exact caffeine content, including preparation. We only measure caffeine levels in our decaf tea, but to give you an idea, you can assume there’s approximately 40 – 70mg of caffeine in a cup of everyday tea. Do your Infusions contain caffeine? Most of our infusions (those which do not contain any tea, Camellia Sinensis) are naturally caffeine free, but some do contain caffeine. For those which do contain caffeine, we put a little note on the back of packs, near the ingredients list. We use the carbon dioxide method to remove the caffeine from our decaffeinated teas, because it’s better for the planet than some other methods which use chemicals such as Ethyl Acetate and Methylene Chloride. You can read more about it here. I live in the UK, where can I buy your tea? 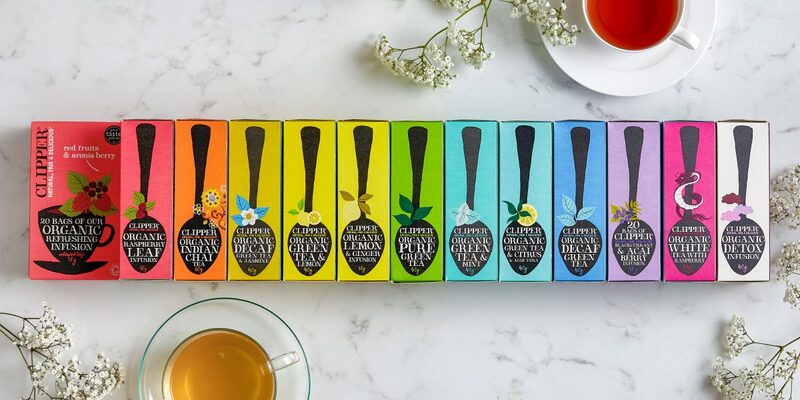 We sell our teas throughout the UK’s supermarkets, including Tesco, Sainsbury, Asda, Morrisions, Waitrose and Booths, online through our webshop, Ocado and Amazon, and through lots of lovely health food stores and independent retailers. I live abroad, where can I buy your tea? Clipper Teas are supplied by a number of distributors worldwide; to find out where to buy our drinks, please visit this page to contact one of our international distributors directly. Of course, you’re welcome to buy from our online shop. For any questions about international online orders please contact clipper@clfdistribution.com. I live abroad, can I distribute your tea? Please drop an email to international@clipper-teas.com to chat to us about international distribution opportunities. Why can’t I find my favourite tea in my local supermarket? Supermarkets are constantly adjusting their ranges, and if you can’t find the blend you’re looking for, just ask the Store Manager – they do listen! Why can’t customers outside the UK enter your competitions? Unfortunately the cost of international postage and various export restrictions mean we can’t open our competition to international entrants, but this is something we’re working on! Why is my teabag a darker colour? It’s a different colour because it hasn’t been bleached! It may make the bags look a little different, as it is more naturally brown in colour and we appreciate that it seems quite a contrast to the white tea bags that you are used to seeing. We know that the unbleached teabag paper has no impact on taste, so we felt it was only right to use the most natural packaging we could source. Will it make my tea taste different with unbleached paper? No, you can rest assured that our lovely teas will remain just as delicious! Our expert Tea Guys carefully tested and retested our teas in the unbleached tea bags (and sometimes as just a cup of hot water with the paper in, bless ‘em! ), and even with their incredible taste buds, attention to quality and detail they were left satisfied that the great taste of Clipper would not be compromised. To top it off, we even ran some blind tea tasting sessions with bigger groups of tasters and they could not tell the difference between the tea in bleached and unbleached paper too! The quality of our blends is something that we pride ourselves on, always sourcing premium ingredients with a clear conscious. If Clipper has chosen to use unbleached paper, why do other companies bleach their paper? Here at Clipper, we’d suggest that the decision to choose whether or not to use bleached tea bag paper is mainly aesthetic, although there are obviously supply chain implications to both options. While other tea companies may be comfortable to use bleached paper, at Clipper we think that if we can remove one step from the production process and still bring you the best tasting teas that it’s an easy decision. Do all the teas made by clipper use unbleached paper? Yes! And what’s more, they are also non-GM and plastic-free. Hooray! For more information on this see our plastic-free FAQs above. Are bleached bags dangerous/harmful to me? Bleaching paper for use in tea bags is not dangerous or harmful to tea lovers based on the current methods; it’s a purely cosmetic decision. As we are now in a position to source unbleached paper for our entire range, we feel that it is the best decision for Clipper and our consumers, and we’re helping to make change better. What is used to bleach tea bag paper? At Clipper, if we had to use bleached paper we would opt for the process known as TCF (total chlorine free). TCF paper does not use chlorine (as its name suggests! ); instead it uses oxygen and either hydrogen peroxide or ozone. Through this process, the oxygen is used to remove the colouring (lignin) from the wood and ozone and/or hydrogen peroxide is used to complete the bleaching process. The alternative process used for bleaching teabag paper is known as ECF (elemental chlorine free) where the wood pulps are bleached typically with chlorine-dioxide. Through our own developments with the paper suppliers, we are extremely pleased and excited to have unbleached paper that can be used throughout all of the Clipper production. Is there an environmental impact of bleached vs. unbleached? We feel that by not using any bleached paper at all, we are being as environmentally friendly as possible as we are not using any bleaching agents or practices towards our paper; in fact, we’re being as simplistic about this as possible. We are pleased to be able to remove it from our processes and supply chain to bring you a great tasting, natural cup of tea. Where do the tea bags came from? The tea bag paper is sourced via our experts within Clipper and our teabag paper supplier and all our teabag paper is manufactured here, in the UK. The main elements of tea bag paper are the wood pulp, which is sourced globally (but mainly from Europe) and cellulosic long fibres, such as abaca, which are sourced from the Philippines and Asia. We are really proud that all of our tea bags are not only unbleached, but also non-GM and plastic-free. Are the elements that create the paper certified in some way? Yes, the wood pulps that are used in the paper production are either FSC or PEFC certified. Why are some of your teabags in individual envelopes? Some of our teabags are sold in envelopes; this is to help them stay fresh, to protect them and to keep their taste so special. When they are wrapped, the ingredients can be protected from external factors like sunlight and moisture, allowing the great taste and flavours to remain. It also helps if they’re in a cupboard full of tea, keeping their great flavour in and the other aromas floating around your tea cupboard out! We also know that more and more people want to take their favourite tea with them when they pop out; go to work; to put in their handbag or to keep in their overnight bag, so by giving the teabag its own envelope, our consumers can drink the great taste of Clipper when they’re out and about.